Since I've got the question about what is out there for 15mm and how we play 15mm KoW. I've written a quick article about it meant as an introduction, please post any feedback or questions below. First off there are several systems which are popular in 15mm, both for Skirmish and Rank ’n’ File. I will be focusing on Kings of War and Vanguard, both done by Mantic. Among others are: Horde of Things, Battle Valor, Dragon Rampant, Song of Blades and Heroes, Frostgrave etc. Kings of War handles your bigger battles with 50+ infantry while Vanguard deals with those minor skirmishes taking place before the main battle. Be it scouting, raiding and so on. They both tie in together for a more narrative approach to your wargaming, where Vanguard supports with an experience system, individual equipment etc. First of all I want to say that we don’t play competitive games in my circle of friends. KoW is a good game for such, and has a great tournament scene. But you will have to be a bit more careful when scaling down to get the exact translation. As long as your group agrees on a meta you should be just fine. In my gaming group we simply convert inch to cm, which is easy and works great. For basing material we use Woodland Scenics Fine Turf which are available in several different colours. Here I recommend to coat with PVA and flock, once dry mix ¼ PVA and ¾ Water. Soak the flock and flock again. This gives a much richer basing and cover any edges from tabs on models etc. Link to tutorial. In KoW you track the amount of damage a unit has taken, and take a Nervtest to see if the unit breaks/flees. To track the damage taken by a unit we use 5mm dice placed behind the units. Seen on some of the photos below. Simply add them up. Dice and diceholders are available from Pendraken. I would recommend a two sets of 10 dice and one set each of the double and tripple frames. The lore in Kings of War is a bit weak compared to Warhammer, but it’s been deepening a lot in recent year and given time it will be a good setting as well. There is nothing preventing you from setting your battles in the Old World or creating your own setting. There are a few Novels available for KoW from Mantic, other than that the lore is sprinkled throughout the books. There are several ways to run a campaign using Kings of War/Vanguard. Either there is the Destiny of Kings Campaign supplement. Or older CoK has rules for both campaigns as well as an experience system for your units. Vanguard of course has its own campaign system with links to KoW as well. Where your different Vanguard missions directly affects your KoW battles. 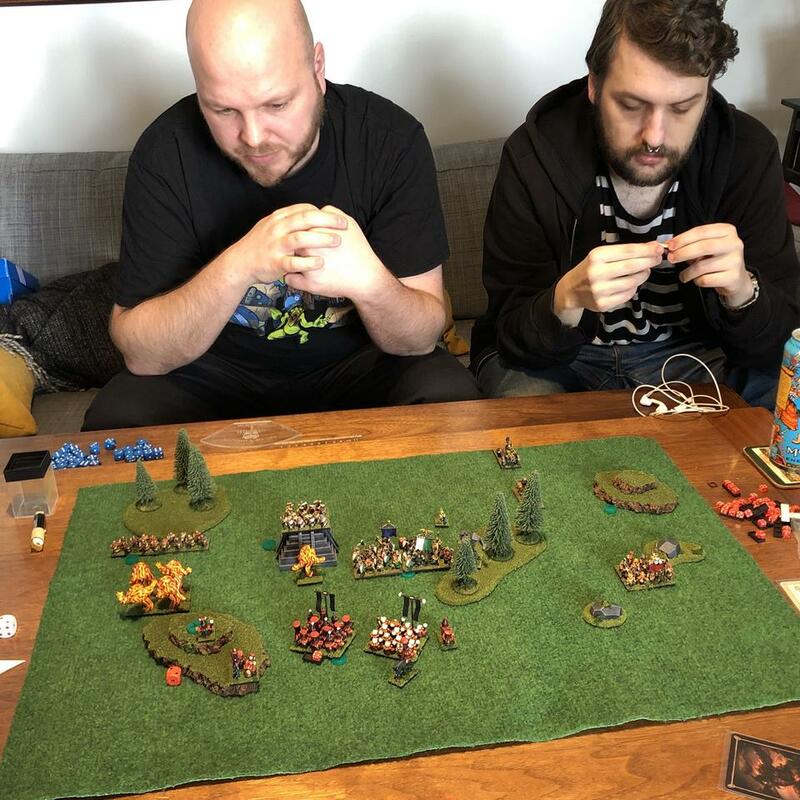 In 2018 Mantic ran their Edge of the Abyss summer campaign which was a success and brought the lore of KoW forward. They have promised to follow up on more campaigns in the future. CoK19 brought the Siege Rules to KoW as well, which we have not yet been able to try out. If you join the "15mm Fantasy Gaming" on Facebook there is a long list of 15mm ranges/reseller available. 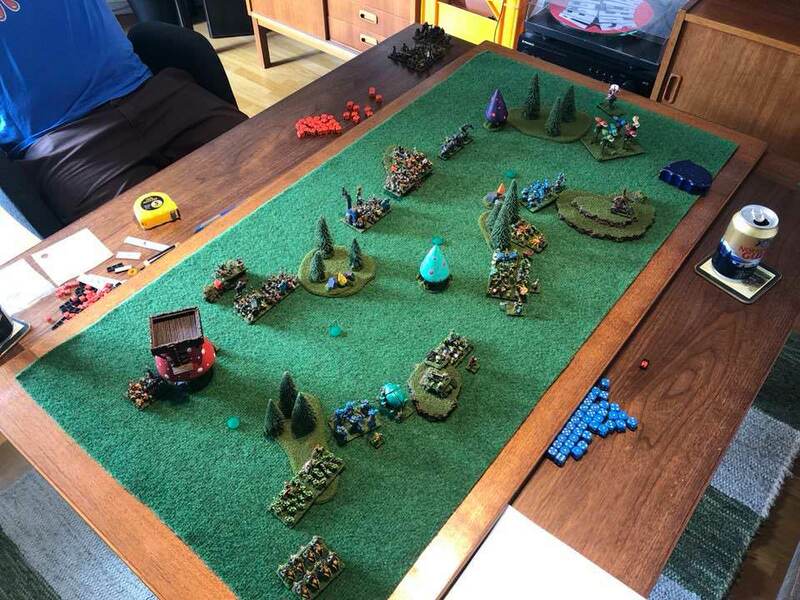 Here are some photos of our last battle, a small battle of Tjublings vs some of the last Free Dwarves. Here is a bigger battle about 3000pts Id say, Goblins vs Free Dwarfs. Vanguard is a skirmish set for night raids, scouting forces or minor clashes before the main battle using Kings of War. The main rulebook for Kings of War 2.0. This it what you will want once you have tried out the free rules. It contains all the rules explained, a bit of lore and army lists for: Forces of the Abyss, Forces of Nature, Undead, Dwarfs, Elves, Abyssal Dwarfs, Goblins, Orcs, Ogres, Basileans and the Kingdoms of Men. Uncharted Empires, contains army lists for: The Brotherhood, Salamander Armies, The Herd, The League of Rhordia, The Trident Realms of Neritica, The Empire of Dust, Night-Stalker Armies, Ratkin Armies and the Varangur. As well as some background for each faction and some "new" army wide faction rules. Clash of Kings 2019. Contains the rules and scenarios for Siege games. 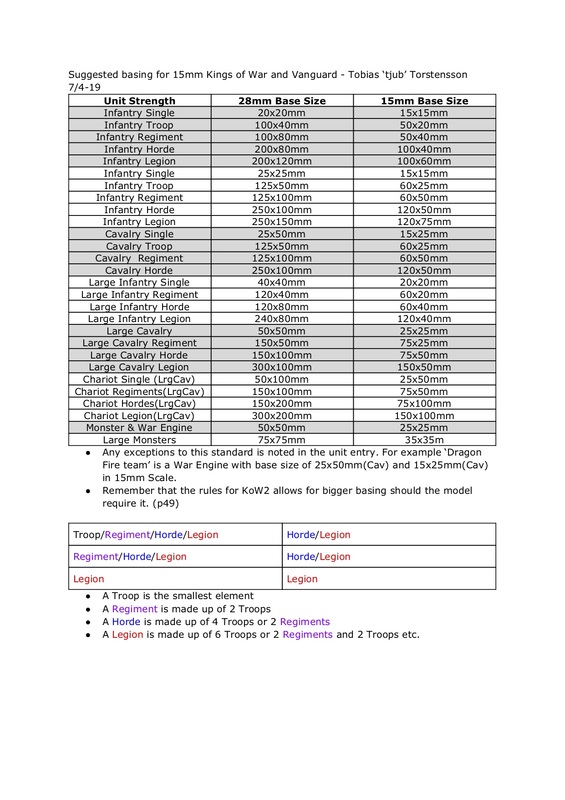 KoW balance updates, "new" units, Living Legends and Formations for all armies. New/updates spells and artifacts. As well as the introduction ofLegendary spells and new/updated competitive scenarios for 2019. Clash of Kings 2018 Note that this book is considered obsolete with CoK19 rulewise Contains the conclusion to the Edge of the Abyss campaign, new maps and lore. "New" units and Living Legends from the Edge of the Abyss campaign, as well as formations for all armies currently without. 2018 updates for spells and items as well as 2018 versions of the competitive scenarios. Clash of Kings 2017 Note that this book is considered obsolete with CoK19 rulewise. This was the first CoK and focused a lot on how to organize a tournament and a league. There are some good ideas on how to grow your games, as well as a Experience system for your units and characters. Thoughts about terrain in a tournament. And ideas/guidelines for creating your own units in Kings of War. And of course updates for the 2017 meta with, characters, units etc. KoW Battlefield Cards. These are fun and my group tends to use it alot for casual games. As longs as you agree on forehand you can use some of the rules/cards for normal CoK missions as well. 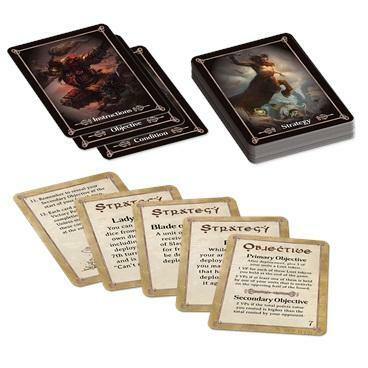 "Objectives" these cards more or less lets you design your own missions by drawing cards and choosing a primary objective for the battle as well as a secondary objective reviled during the course of the battle. Also include "Battlefield Conditions" which can have none or a big impact on the battle, fog, rain etc. "Strategy" gives you small hand of cards which can be played for effects during the battle to tweak the course. Edge of the Abyss. Mantics first global campaign that run during summer/autumn of 2017. Mantic used the outcome of this campaign when they progressed their lore for the game. The campaign ended with overall "good" victories except in a few areas which brought the Nightstalkers to have bigger impact, flooding the Abyss, forced the free dwarves to flee unto the dwarven empire etc. EofA Campaign brought formations, scenarios as well as Living legends for most armies. All of which are collected in the latest CoK. The Destiny of Kings - Kings of War Campaign Supplement. Contains different ways/ideas how to structure and set up your own campaigns as well as "The Quest of the Necromancer Campaign". Some senarios include Mantics Dungeon Saga, they could pretty easily be translated be played with Vanguard instead. Kings of War - Historical. This is not a historical war-game as much as a way to expand your setting and include Historical armies if you want to. For example the Romans have a generic roman feel to the army rather than correct fromations for all the specific time periods of the Roman Empire. That said, of you ever wanted to field Romans vs Goblins etc this is a fun book. Also contains some interesting rule concepts/ideas for your games like "skirmishers" and "up hill charges" and a few scenarios etc. There is also a list for "mythical" creatures to be used with the historical armies. Hellfire and Stone. H&S is a narrative campaign for Kings of War 1, featuring an epic conflict between Dwarfs and Abyssal Dwarfs. As well as six scenarios that link up the story of the campaign, Living Legends etc. Thought this campaign is set for the first version of KoW its easily adopted for KoW2, since its a campaign I guess its mostly interesting for players who have a more narrative approach to the game and want to refight that conflict. Vanguard. Even they the basic Vanguard rules are free, you will eventually want to get the full advanced rules. These will let you play out the actions taking place before the main battles. Be it plundering an enemy camp, burning their stores, opening a portal, stealing information or assassination of an enemy commander etc. This book includes all of the core rules for playing Vanguard, including unit entries, scenarios, campaign system, advanced spells and abilities, and rules for tying your games into Kings of War. Be aware though that Vanguard is a "living game" with new units added every now and then. Rules for these new models/factions are available with the models OR FREE AT Easy Army Vanguard. Great introduction! Such presentations have become a necessary good in these times of a split fantasy wargaming scene, especially with more scales popping up for evil dwarf collectors. We should make entry into new systems smooth and helpful, which you've done well above. This post may come to serve as a placeholder, where others' similar polished introductions to 15mm wargaming in other systems will be quoted. Thread stuck, and not because of pecuniary self-interest ("gimmeyourmoney!"). I think a similar thread - if someone in the know can write a good presentation - will be called for in 10mm when Dancing Yak Miniatures release their range. Whole new worlds of evil dwarf action opens up in these days! Thank you for your excellent summary. This is worth some slaves. Will it use as a reference in the future. My friends look for models now, they`ll buy some models in onlineshops and add maybe some 3D Prints where no models are available for unit entries (one guy has a 3D Printer). I`ll use Tjublings obviously . Thanks a bunch for this comprehensive summary for 15mm wargaming! Exactly what I needed to get a grasp on it. The simple inch -> cm conversion is quite clever, makes transitioning very easy. Got the question which miniatures I use for K'daii/Obsidian Golems. Here is how they scale up with Tjublings. Added a short description for each book available for KoW as well as what I thought might be of interest for newer players. A very good summary, not only for 15mm players. Wow, this got all-encompassing. Excellent! Anyone up for writing similar introductions for other games? BB, AoS, T9A, Dragon Rampant... You name it. We want them all. Updated the original post with a new table for our Base Standard. This should cover it all, let me know if Ive missed something.